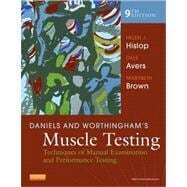 A practical handbook on evaluating muscular strength and function, Daniels and Worthingham's Muscle Testing: Techniques of Manual Examination and Performance Testing, 9th Edition makes it easy to understand and master procedures in manual muscle testing and performance testing. Clear, illustrated instructions provide a guide to patient positioning, direction of motion, and direction of resistance. In addition to muscle testing of normal individuals and others with weakness or paralysis, this edition includes new coverage of alternative strength tests and performance tests for older adults and others with functional decline (such as the inactive and obese). Written by educators Helen J. Hislop, Dale Avers, and Marybeth Brown, this classic physical therapy reference now features an Evolve companion website with video clips demonstrating key muscle testing techniques. Drawings and arrows along with clear written directions make it easy to understand and perform muscle testing procedures, allowing you to assess deficits in strength, balance, and range of motion. More than 600 illustrations clearly show testing sequences, muscle anatomy, and muscle innervation. Video clips of over 100 muscle tests on the Evolve companion website demonstrate the art and technique of muscle testing in a clinical setting . Details of muscle anatomy and innervation help in linking muscle topography with function. Helpful Hints and Substitutions boxes provide additional tips and highlight muscle substitutions that may occur during a test to ensure greater accuracy in testing. A constant reference number clearly identifies each muscle in the body, indexed in the Alphabetical List of Muscles by Region as well as in the Ready Reference Anatomy Manual on Evolve, to speed cross-referencing and help you quickly identify any muscle. NEW chapters on performance testing cover functional strength testing in older adults and those with functional decline, and testing muscle performance in various clinical settings. NEW chapters on manual muscle testing address when to use manual muscle testing, the limitations of manual muscle testing, and alternatives to manual muscle testing. UPDATED references for each chapter include the most current evidence-based information. NEW! An Evolve companion website helps you hone your manual testing skills with video clips of over 100 muscle tests and with the Ready Reference Anatomy Guide.